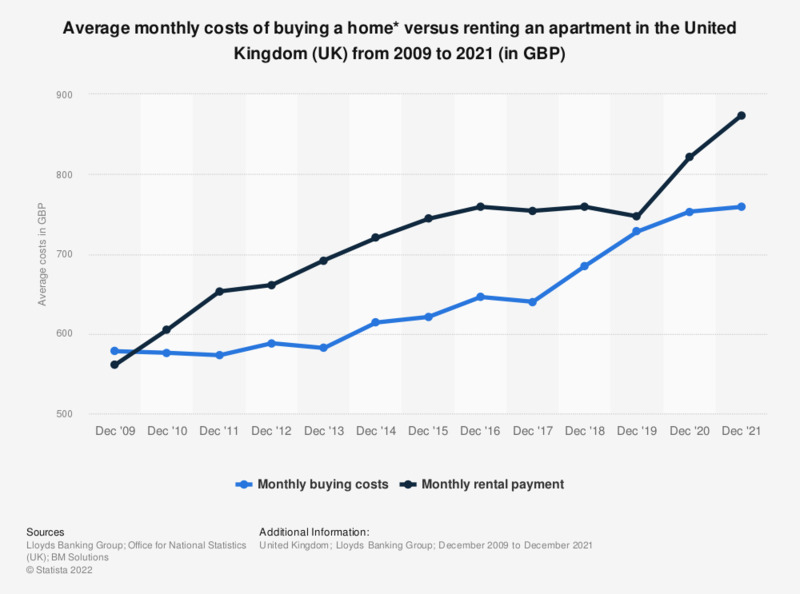 This statistic shows the comparison between average monthly cost for buying a home for first-time buyers versus monthly cost of renting residential property in the United Kingdom (UK) from 2009 to 2017. Over the years, the ratio changed in favor of cheaper costs for buying vs renting. In December 2017 the average monthly costs associated with buying a three bedroom house in the UK amounted to 679 British pounds for a first-time buyer, while monthly rental costs rose up to 754 GBP. *Payments refer to the average for buying and renting a three bedroom house over 12 months to December for each year for the first-time buyer. Statistics on "First time home buyers in the United Kingdom (UK)"